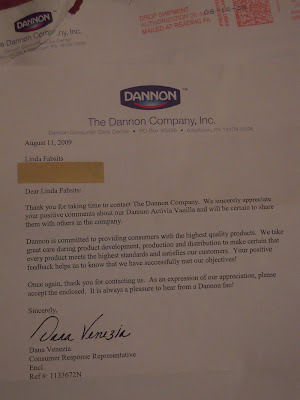 Last July I posted a letter I had written to The Dannon Company. At the time several people questioned whether I had actually sent it and others insisted that I must. Well, I did in fact send the letter to them but had totally forgotten about it until I was going through a pile of old paperwork the other day. To follow is the letter, if you want to read the comments from that post here is the link. Upon hearing the testimony of Jamie Lee Curtis and the wonders of Activia I thought I’d take you up on your challenge. Sure, there are other brands out there containing probiotic cultures, but Activia is the only one with its own fancy schmacy term, namely ‘Bifidus Regularis’. Your claim was that if I included Activia in my daily diet it would help regulate my digestive system by helping to reduce long intestinal transit time and it is a delicious way to do something good for my body. It’s been two weeks and I must concur that your product is in fact delicious, vanilla being my favorite flavor. I can also vouch that it does decrease intestinal transit time by leaps and bounds. The part about being regular is where I have concerns. What exactly is your definition of ‘regular’, because if it means every half hour then I can definitely give it a thumbs up. Your website stated that if I didn’t feel the difference my money would be refunded, up to $12.00. Well, I can’t deny that I don’t ‘feel’ it. I’ve been ‘feeling’ it for the past few days. Therefore I am not writing to ask for a refund, or even for any coupons for your product. What would be nice is a free tube of Preparation H and some Quilted Northern Ultra Plush bath tissue. Oh wait, they have a ’challenge’ too! Though this is the letter I sent verbatim, I also included my name, address and phone number in addition to signing off as ‘Fire in the Hole’ because I wanted to see if they responded….and they did. My husband received a phone call while I was at work so I returned the call the next day during working hours with my ‘complaint’ number. Though the woman I spoke with seemed pleased that I had taken the time to write them, she was quite concerned with whether their product had caused diarrhea. She must have asked, “Did you experience diarrhea?” at least five times. A few weeks later I received a letter and coupons for free stool softeners Activia. I threw out the coupons because, really? I did use the moniker ‘Fire in the Hole’ for a reason. What I thought was interesting was that their letter only concentrated on the positive…which was the fact that I liked their vanilla flavor. Go ahead and double clicky on this pic to enlarge it. Did you take note of the line that reads: “Your positive feedback helps us to know that we have successfully met our objectives!” I’m glad they were able to put a good spin on it but what about the fire in my hole? I once wrote a complaint letter to a manufacturer of instant hot chocolate, because I opened a packet once and found it writhing with meal worms. They sent me coupons for more product. Because yes, I'm going to be compelled to purchase the same product again after finding worms in it. "I’m glad they were able to put a good spin on it but what about the fire in my hole?" I'm going to duct tape my fingers together so I can't type. Because temptation is a bugger. Hilarious!!!! You've made my day. My husband eats Activa every morning, and I've always resisted his suggestion to do the same - I should show him this.